Joanne Huist Smith ’96 will sign copies of “The 13th Gift” at the Wright State University Bookstore on Monday, Nov. 24, from 11 a.m. to 1 p.m.
Joanne Huist Smith was busy getting her three children off to school on a cold December morning in 1999, when she discovered a package on her front doorstep. She and her three children — Ben 17, Nicholas 12 and Megan 10 — were facing their first Christmas since the death of husband and father, Richard. No one was in the mood for holiday cheer. The next day another gift mysteriously appeared, then another and another. Smith’s new book, “The 13th Gift: A True Story of a Christmas Miracle,” chronicles a family’s special version of the “Twelve Days of Christmas” carol. The bright red door on the book’s cover welcomes the reader inside for a glimpse at how a random act of kindness helped a family journey from heartache to healing. She hopes “The 13th Gift” will help others who have experienced a loss. Smith will sign copies of “The 13th Gift” at the Wright State University Bookstore on Monday, Nov. 24, from 11 a.m. to 1 p.m. The public is invited. 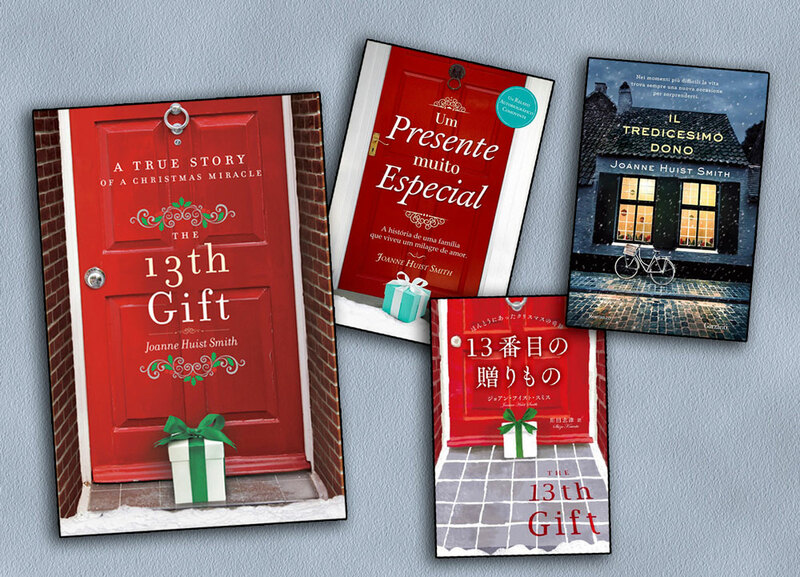 “The 13th Gift” (shown left, in English) has been translated into Portuguese, Japanese and Italian. As the gifts continued to arrive, the family tried to catch their Secret Santas in the act, but never did. In fact, their identities remained a mystery to the family until last year. “I will forever be grateful to them,” Smith said. Visit 13thgift.com or follow Joanne Huist Smith on Facebook for more book details. Smith decided she wanted to become a writer after reading “Harriet the Spy” at age 9. Just like the character in the book, she began journaling daily. Later she wrote a short story, but members of her local writers’ group convinced her to attempt a book. Smith pitched the story idea to agent Hannah Brown Gordon of New York-based, Literary Foundry & Media at the Antioch Writers’ Workshop in Yellow Springs, Ohio, last year. She came to terms on a book contract with Harmony Books, a division of Random House, just two days before she retired from the Dayton Daily News on Nov. 22, 2013. Smith’s life has been a flurry of book-related activity ever since. After writing “The 13th Gift,” she recorded the audio version of the book at a Dayton studio. Her agent has negotiated contracts with publishers around the world, including Italy, Brazil, Japan, Portugal, Australia, New Zealand, the United Kingdom and Taiwan. Smith’s college education took a backseat to raising her children. As a stay-at-home mom, she took classes part time until her daughter started kindergarten. 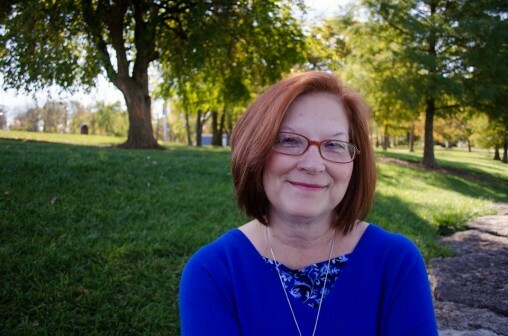 Smith shared her dreams of becoming a writer with an advisor in Wright State’s Transfer Student Resource Center, who asked her to bring her writing samples in the next day. “So I physically brought in one of my husband’s size 13 shoeboxes full of poems and short stories,” she recalled. The box was filled with pieces of paper, torn bits of napkins and notebooks. The advisor helped Smith get her first scholarship. In fact, her first writing job was as a student writer in Wright State’s former Office of Public Relations. Scholarships from the English department and the College of Liberal Arts, as well as a stipend as editor of The Guardian student newspaper, allowed her to pursue college full-time her last two years. She also published a short story in Nexus, Wright State’s literary magazine. During her senior year, Smith began freelancing for the Dayton Daily News, while also writing articles for parenting magazines. After graduating with a bachelor’s degree in English in 1996, she was hired by the Dayton Daily News, where she shined as an award-winning journalist. “If it wasn’t for Wright State, I wouldn’t have had a 17-year career in journalism,” she said. Smith understood the value of her degree when she was left to raise her children on her own. Smith is working on a second book of creative nonfiction.